Homebrew makes it easy for Mac users to install command line tools, so it’s only logical that it runs entirely from the command line. But that doesn’t mean having access to a graphical user interface isn’t handy from time to time. 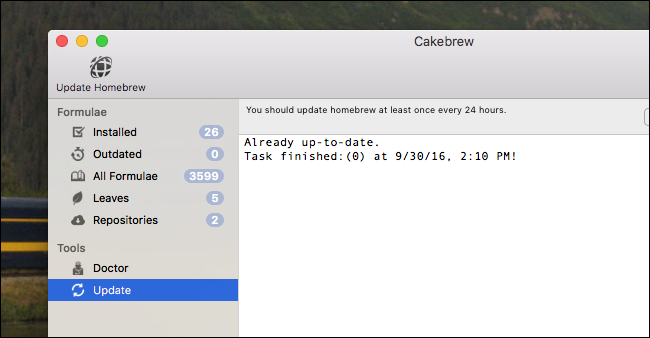 Cakebrew is a free Homebirew GUI that makes overseeing your setup just a bit easier. Sure, Homebrew may be all about the command line. But maybe you want to see a quick list of your installed formula, or run a quick search and see what the various formula are for. In both cases, some users are going to prefer a GUI, and Cakebrew is that GUI. It’s kind of like Ubuntu’s Synaptic Package Manager, but for the Mac (though not quite as powerful). Needless to say, this guide only applies to people who already have Homebrew installed. If you don’t, you can check out our tutorial here. You can download the program at Cakebrew.com. The application comes in a DMG file, just like other Mac apps. 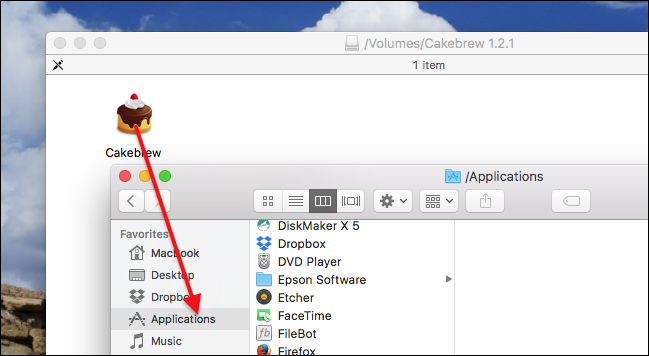 Open it up, and drag the Cakebrew icon to your Applications folder. That will automatically install the program in the “Applications” folder in your home folder. 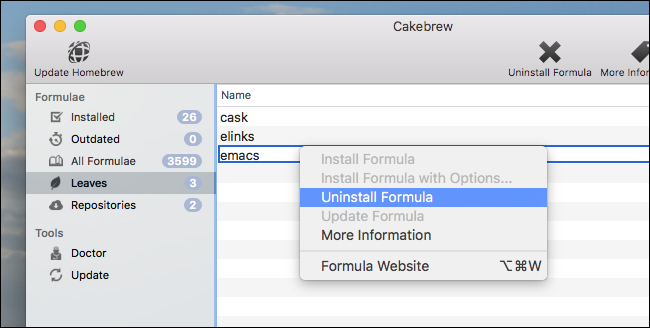 Installing software with Cakebrew is…well, a cakewalk. You can browse a complete list of all Homebrew packages in the “All Formulae” section of the app. Here you can search, or simply scroll, though the complete list of software available to you. Click on any software to see a description of features at the bottom of the window. To install any application, right-click it in the list, then click “Install Formula.” You will be asked if you’re sure. Click “Yes” and the installation process will begin. You’ll see the output, just like installing from the Terminal. And when the installation process is complete, you’ll get a notification. Then you can go ahead and use the application. It’s arguably a little more complicated than typing brew install ansiweather, but it’s a lot easier to search and browse all the tools available to you. And the best part is, everything you install from the Terminal shows up in Cakebrew, so if you just want to use this tool to manage what you’ve already installed, you can. Speaking of: you can also uninstall software in Cakebrew. The “Installed” section shows you everything that’s currently installed. You can uninstall anything by right-clicking, then clicking “Uninstall.” Most things in that folder are going to be dependencies of programs you still use, however, meaning uninstalling them will break things. This is why it’s a good idea to check the “Leaves” section instead. Here, you will only see things that no other programs depend on to function. You can uninstall things here without worrying, so go right ahead. There are two key tools offered by Cakebrew: Doctor and Update. Doctor runs brew doctor, which outputs a list of potential problems with your Homebrew setup. If your Homebrew keeps failing, it’s a good idea to run this and fix the problems listed. The second tool, “Update,” runs brew update, which ensures that Homebrew and all of your applications are up to date. It’s a good idea to run this regularly, especially right before installing anything. I really only have one complaint about Cakebrew: you cannot use it to browse the applications offered by Homebrew Cask. This repository lets you install GUI applications, like Chrome or Onyx. It would be neat to have a GUI tool for browsing GUI applications, but sadly that’s not to be…at least yet. Even with this limitation, Cakebrew is a great tool for any Homebrew user to have on hand. You won’t use it every time you use Homebrew, but I bet you’ll occasionally be happy you have it.